There is overwhelming evidence demonstrating the importance of brachial blood pressure (BP) as a predictor of future cardiovascular disease (CVD) risk. However, BP has a number of components, which show a distinct age-related pattern of change. A number of large observational studies demonstrate that diastolic blood pressure (DBP) is a more powerful predictor of coronary heart disease risk than either systolic blood pressure (SBP) or pulse pressure (PP) in younger individuals (age <50 years). In contrast, considerable evidence demonstrates the superiority of increased PP and decreased DBP to that of elevated SBP in predicting risk in older individuals. 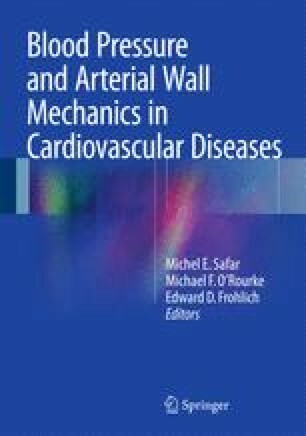 Increasing interest in arterial hemodynamics, especially over the past 20–30 years has generated abundant evidence that SBP changes throughout the arterial tree, such that SBP and PP are higher in the brachial artery than in the ascending aorta. Emerging data support the concept that central (aortic) BP may be superior to brachial BP in predicting future risk. However, the inclusion of central BP into routine clinical practice will require more definitive evidence that central BP is superior to brachial BP in risk stratification and prediction of risk.